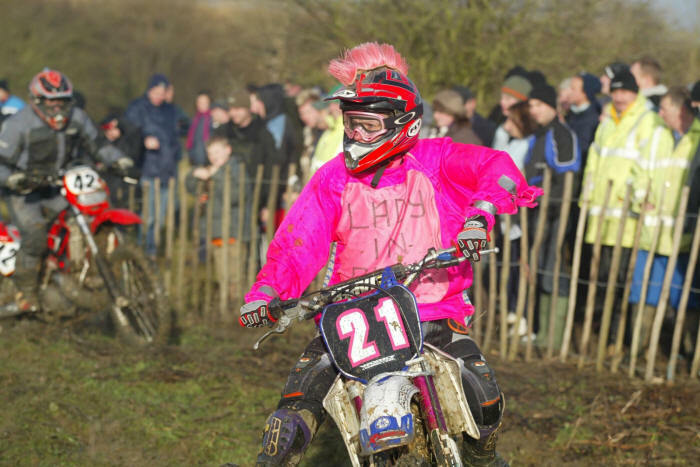 This year marked the 82nd running of the Northampton Motorcyclists Club's annual charity Boxing Day scramble, the Wild & Woolly, which is thought to be the oldest motorcycle race in the world still running. The format of this historical event remains largely unchanged. 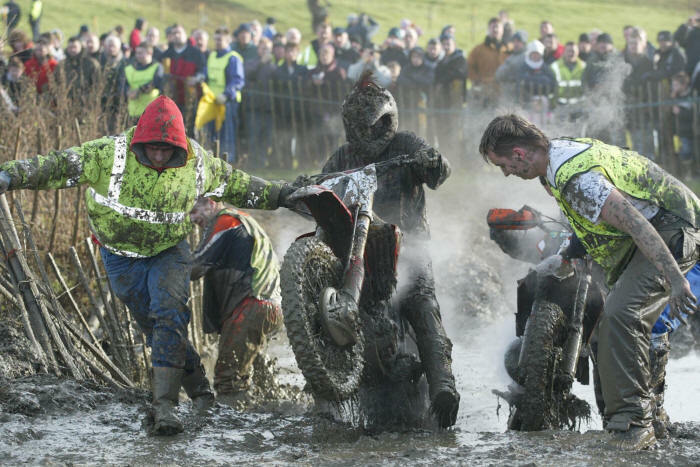 A full line-up of riders take on a long challenging course involving four river crossings every lap and some challenging hills in notoriously unpleasant conditions. There is just one race lasting one hour or 20 laps, whichever is the quickest. Tactics play a part as some riders, particularly those with oversize fuel tanks attempt to complete the full distance without refuelling, whilst others make a fuel stop during the race to avoid running dry in the closing stages. 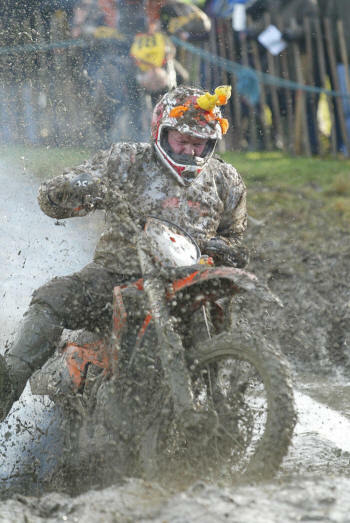 Bikes also show all manner of unusual modifications specifically for this event, mainly to assist with waterproofing and to help with being pulled out of the rivers by the army of eager mud-covered marshals. This year the weather was mild and sunny and the ground appeared fairly dry under foot. Extensive track work had been carried out by the organisers to prevent bottlenecks occurring at the waterholes this year, and the 10.00am practise was relatively problem-free. In other years under more extreme conditions practise can be as far as many riders ever get. This event attracts enormous crowds of local supports, keen to work off some of their Christmas excesses and cheer on the brave and foolhardy alike. They pack the track sides often ten deep, reeling as back tyres launch plumes of wet sticky mud in their direction but refusing to give up hard fought-for vantage points. Just before 11.00am the startline filled with bikes once again, and after briefly warming engines the starter's red flag was raised and the line fell silent. Riders waited nervously on the line until at precisely the top of the hour the flag dropped and the peace was shattered as bikes roared into life and set off from the dead-engine start. 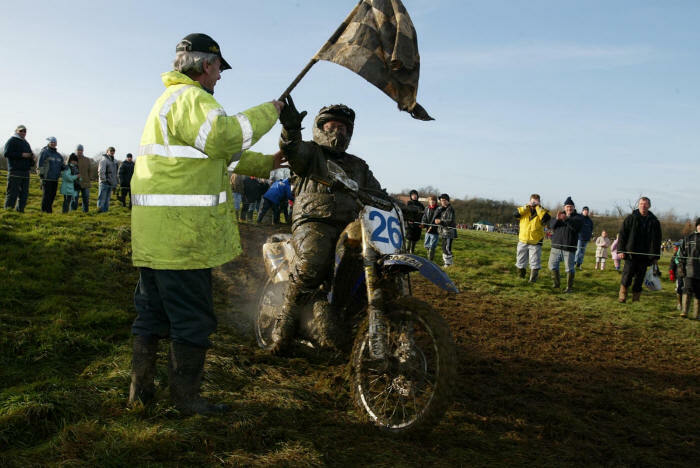 As the riders reached the crowds at the first water crossing, it was current UK Over 35 Cross-Country champion Richard Main who lead the pack. Eight-time previous winner Ryan Griffiths had started much better than last year in fifth place and was up challenging for the lead three corners later. Third place at this stage was a closely fought battle between Kevin Finch, Adam Castledine and James Barnwell. With the ground thawing it was some of the flat land areas that proved the trickiest, as deep slippery ruts began to appear. A difficult off-camber hill following directly after the final water crossing also proved challenging and was rarely clear throughout the entire race, sometimes claiming a dozen victims at a time. On lap two Ryan Griffiths made his move and passed Richard for the lead but was unable to shake him off as Richard stuck closely to his rear wheel for the next three laps. The water crossings were definitely proving more passable this year with the top riders jumping into some of the ditches. The slower riders still gave the crowds plenty to cheer about however as they slipped, spun, looped and fell headlong into the mire. By lap six Ryan had stretched the gap over second to around fifteen seconds, with the leading pair nearly two full minutes clear of third. Third place was continuing to be a close fought battle, with Kevin Finch still ahead of Adam Castledine and James Barnwell, though they traded places regularly. On the following lap an error from Ryan allowed Richard Main back into the lead though Ryan was not in any mood to let him keep it for long. 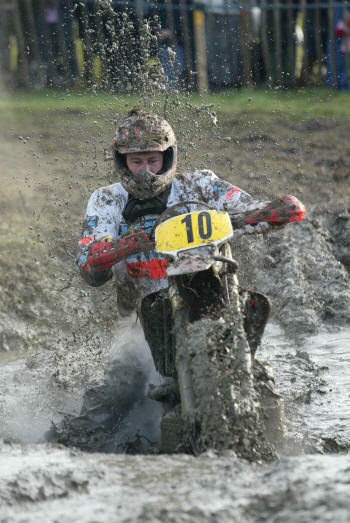 After attempting to cut across some treacherous ruts a tired-looking Richard went down, losing around thirty seconds to the lead as he attempted to restart. After finally shaking off his pursuer, Ryan dominated the mid-section of the race as he'd done so many times before. At around the three-quarter distance mark Ryan continued to lead and had lapped almost the entire field, apart from Richard Main who was making steady but slow progress back towards the leader. A mistake by the leader then allowed Richard to close right up. With both front-runners now looking distinctly weary, Ryan looked back and saw Richard right on his rear wheel once again. The battle for 3rd by this time had spread out somewhat and is was less clear exactly who was where. Mark Bussey had made his way through the field to challenge James Barnwell for third, whilst Adam Castledine, Kevin Finch and a late charging Dennis Harrison fought for fifth. Richard Main then retook the lead, with Ryan close behind until a fall in the water cost him a lot of time. Richard then took his turn to dominate the race from the front, opening up a big lead and looking smooth and determined. Despite the earlier mutterings of some spectators that perhaps the course had been made too easy this year, by this stage of the race it was far from it and finishing a lap upright was proving a challenge. On the final few laps the leader could afford some short pitstops to clean gloves and wipe the mud from his grips. Ryan had by now lost sight of the leader, and after nineteen grueling laps a jubilant Richard Main took his first Wild & Woolly victory. Behind this pair and by now two laps adrift, Mark Bussey finished strongly to claim third from James Barnwell. A further lap behind these two, Adam Castledine finished in fifth, just in front of Kevin Finch and Dennis Harrison. Back in the pits Richard reflected on his victory. "It was a great race, I had a good start. I fell first allowing Ryan to get away a bit, but I kept the pressure on and knew I could catch him before the end. He may be a bit younger, but I think I'm fitter. We've both been riding for years, so I need it would be a good race towards the end. Once I got in front I tried to ride steady and not make too many mistakes, but I went down twice on the last lap and nearly threw it all away. That's how it goes though and now I can add this one to my list, its been a good year!" On missing what could have been victory number nine, Ryan had this to say. "I had a much better start this year and I wasn't riding too badly. The water holes weren't a problem to start with, but it was very muddy. Later on I went down in one of the ditches and lost about fifty seconds, that's what cost me the win this year. I clawed back a bit of time on Richard, but I couldn't see him and had nothing to chase after. Richard rode well, he one of the only riders out there with more experience than me. You can't win them all." Mick Wright, Hayley Rilings, Daniel Loveday, Todd Bucknall, Andy Bucknall, John Mitchinson all completed 9 laps. Chris Livesey, James Higgins, Tony Cornelius, Brad Willis, Roger Titman all completed 8 laps.